FactSet Research Systems Inc. FDS reported strong third-quarter fiscal 2018 results with earnings and revenues surpassing the Zacks Consensus Estimate. Adjusted earnings per share (EPS) of $2.18 beat the consensus mark by 4 cents and increased 17.8% year over year. The new tax reform policy (Tax Cuts and Jobs Act, which reduced corporate tax rates significantly from 35% to 21%) and the company’s share repurchase program boosted the bottom line. Notably, FactSet enjoyed a lower income tax rate of 16.5% in the reported quarter compared with 23.2% in the year-ago quarter. We observe that shares of FactSet have rallied 16.1% in the past year, underperforming the industry’s rise of 24.7%. Revenues of $339.9 million beat the Zacks Consensus Estimate by a slight margin and increased 8.9% year over year. Organic revenues grew 5.7% to $332.5 million in third-quarter fiscal 2018. The increase was primarily driven by accelerated sales of content and technology solutions (CTS), analytics products and wealth management solutions. Region-wise, FactSet generated $210.3 million revenues from the United States, which grew 6.3% on a reported basis and 5% organically. International revenues came in at $129.6 million, up 13.4% from the year-ago quarter and 6.9% organically. The uptrend was due to higher sales from international price increase and analytics, data feed products along with a rise in workstation sales. FactSet’s Annual Subscription Value (ASV) was $1.36 billion at the end of the fiscal third quarter, up around 6.3% from the year-ago quarter figure of $1.28 billion. Organically, it increased $9 million during the quarter. Buy-side and sell-side ASV growth rates were 5.3% and 5%, respectively, for the reported quarter. Of this, nearly 84.4% was generated by buy-side clients while the rest came from sell-side firms performing functions like mergers and acquisitions advisory work, capital markets services and equity research. ASV generated $843.6 million revenues from the United States, up 4.4% from the prior-year quarter as well as organically. Internationally, ASV derived $512.6 million revenues, up 8.1% on a reported basis and 6.7% organically. While 13% growth was observed from the Asia-Pac region, Europe grew at a rate of 5%. FactSet added 80 clients in the reported quarter, taking the total number of clients to 4,975. New client additions were driven by its wealth management business. The company retained 90% of its clients. The percentage of client retention was more than 95% of ASV. At the end of the quarter, total employee count was 9,197, up 3.5% year over year. Adjusted operating income came in at $105.7 million, up 5.3% from the year-ago quarter. However, adjusted operating income margin declined to 31% from 31.9% in the year-ago quarter due to negative impact from foreign currency movements. Selling, general and administrative expenses increased 4.5% to $81.6 million. Total operating expenses increased 9.9% to $246.6 million due to restructuring charges and certain one-time administrative expenses. FactSet exited the quarter with cash and cash equivalents of $213.1 million compared with $233.6 million at the end of the prior quarter. Long-term debt was $574.74 million at the end of the quarter compared with $574.70 million at the end of the prior quarter. The company generated $125.7 million of cash from operating activities in the reported quarter compared with $92.3 million in the year-ago quarter. Free cash flow increased to $119.7 million from $84.3 million in the year-ago quarteron improved cash collections. On May 7, FactSet increased its quarterly dividend by 8 cents per share or 14.3% (from 56 cents per share to 64 cents), marking the 13th consecutive year of dividend increase. The raised dividend was paid on Jun 19 to shareholders of record at the close of business on May 31. During the reported quarter, FactSet repurchased 620,000 shares for $122 million. The company still has $309.3 million available for buyback purpose, under its existing share repurchase program. FactSet raised its fiscal 2018 guidance for adjusted EPS. The company now expects adjusted earnings in the range of $8.37-$8.62 per share, compared with $8.35-$8.55 expected earlier. 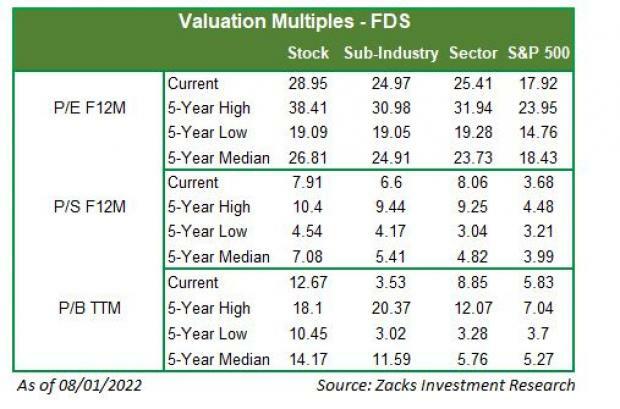 The Zacks Consensus Estimate stands at $8.48, within the currently guided range. The full-year outlook was reaffirmed for organic ASV, revenues, adjusted operating margin and the annual effective tax rate. Revenues are expected to be between $1.34 billion and $1.36 billion (mid-point $1.35 billion). The Zacks Consensus Estimate is currently pegged at $1.35 billion. FactSet currently has a Zacks Rank #3 (Hold). You can see the complete list of today’s Zacks #1 Rank (Strong Buy) stocks here. Investors interested in the broader Business Services sector are keenly awaiting earnings reports from key players like Waste Management, Inc. WM, Accenture plc ACN and Paychex Inc. PAYX. While Accenture is slated to report third-quarter fiscal 2018 numbers on Jun 28, Paychex is scheduled to release fourth-quarter fiscal 2018 results on Jun 27. Waste Management will release second-quarter 2018 results on Jul 25. Last year, it generated $8 billion in global revenues. By 2020, it’s predicted to blast through the roof to $47 billion. Famed investor Mark Cuban says it will produce “the world’s first trillionaires,” but that should still leave plenty of money for regular investors who make the right trades early. Enter your email address to get our headlines in your email!